This giant Easter egg in Citluk's. The egg was painted by artists in the local "naive" style. This giant Easter egg in front of St. Mark's Church in Zagreb stands in the middle of the square. 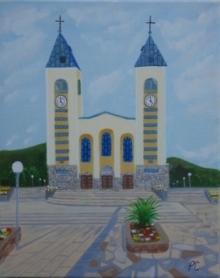 The egg depicts the church with the symbol of Zagreb picked out in tiles upon its roof. The egg was painted by artists in the local "naive" style. This Easter egg in Zagreb's main Ban Jelačić Square shows sights of Zagreb surrounded by red hearts, which are a symbol of the city.